And so the trilogy comes to an end...I just wish Guillermo del Toro had directed this with his dark and surreal vision. I always had the feeling that when del Toro could no longer direct it Jackson said with a sigh, 'Well, I suppose I'd better do it then'. 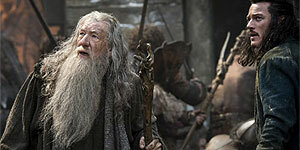 The Hobbit trilogy never seemed to have the same passion behind it as the Lord of the Rings. The story got completely lost somewhere in the dreadful second movie behind a whirl of CGI and 'action sequences' that were as dull as dishwater. The third movie does find the story again, and comes alive every time Martin Freeman is on screen - he's just superb but he isn't on screen that much unfortunately. The rest is more CGI and one very long battle that doesn't half go on a bit. How sad that someone doing Tolkien has to force himself to come back to the wonderful story. My verdict of the trilogy over all - disappointing.